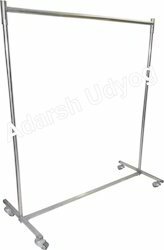 Leading Manufacturer of hanging item racks, single line hanging, garment display racks, four way garment display rack, falling hanger and garment racks from New Delhi. 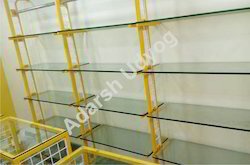 Hanging item racks can be made in form of stands, main purpose it to hang item for selection of cloth by fabric or total design overview of cloth which cannot be possible when garment is on shelf. Hanging item racks is suitable for shirts, trousers or ladies clothing display which is becoming popular in almost all supermarket stores and hypermarkets for customer selection. Garment Display Racks Should be Manufactured in such a manner so that they can easily provide Garment Storage as well as Display of Clothing, our Manufacturing unit produces Garment Racks which are suitable for Supermarkets, Retails Chain Stores and Apparel Stores as per the need of Customers. 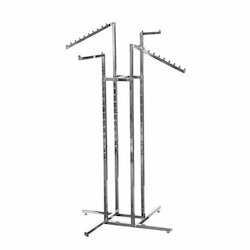 These garment racks which is specially designed to suit the specific requirements of the clients, our garment racks and Garment Hanging Supports are manufactured using quality raw material using advanced technology. Owing to the quality standards, the garment racks are repetitively demanded by clients based all across the globe. 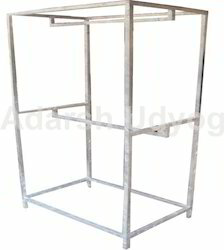 We are engaged in manufacturing and supplying a wide of Garment Display Racks. These are specifically designed by our experienced professionals to ensure excellent visibility of the products. These are made form high grade stainless steel, and which makes them highly durable and useful. These are designed to keep volumes of goods, while occupying less space. Our product range is very attractive and can easily grab the attention of the onlookers. These products are highly flexible, ensuring maximum product visibility. Our product range is examined by our professionals to eradicate all the discrepancies. Clients can avail these products from us at industry leading prices. Adarsh Udyog offers a wide range of polished chrome Waterfall Hanger that is in high demand amongst our clients. These quality products are manufactured in accordance with industry standards and are available in standard & customized specifications as per the clients' requirements. Available in different sizes, shapes and colors, these hangers are extensively used in residences, showrooms, retail stores and trade shows. The wall hangers supplied by us are easy to install on the wall, have space saving design, and are provided with chrome swivel loop hook. We supply these wall hangers at reasonable rate, which are widely used for hanging towels, aprons, coats and other garments . 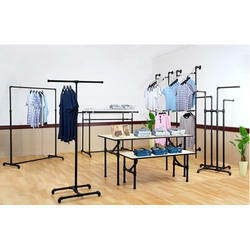 We are the manufacturer of Garment Racks. Type :- 2-Way Rack,Double Rail Rack. 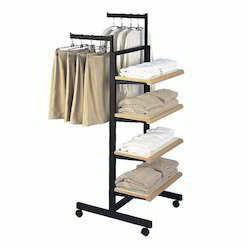 Wall side adjustable garment racks . Available in diffrent height and colours. 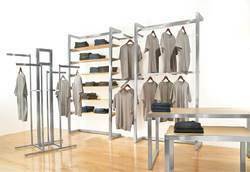 Looking for Garment Display Racks ?